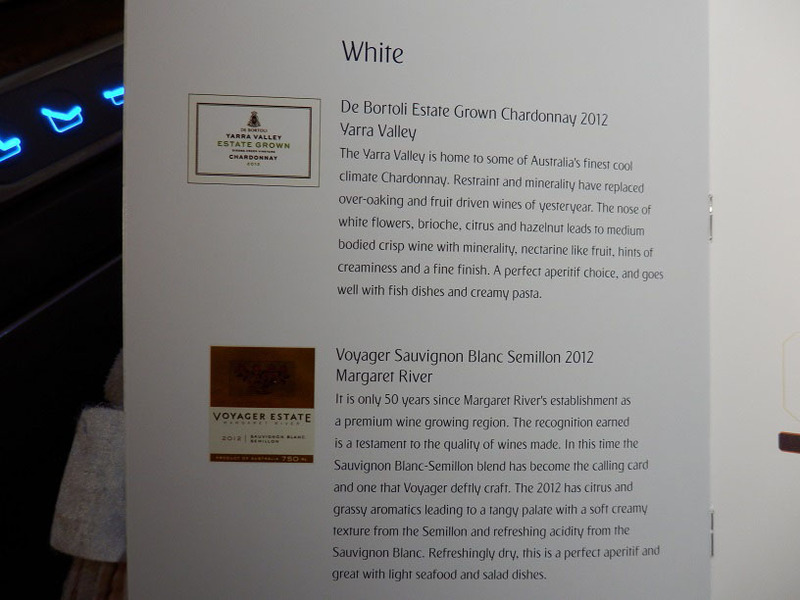 This flight review is from Emirates Business Class in Airbus A380 travelling in the luxury of Business Class from Dubai (DBX) to Sydney (SYD). 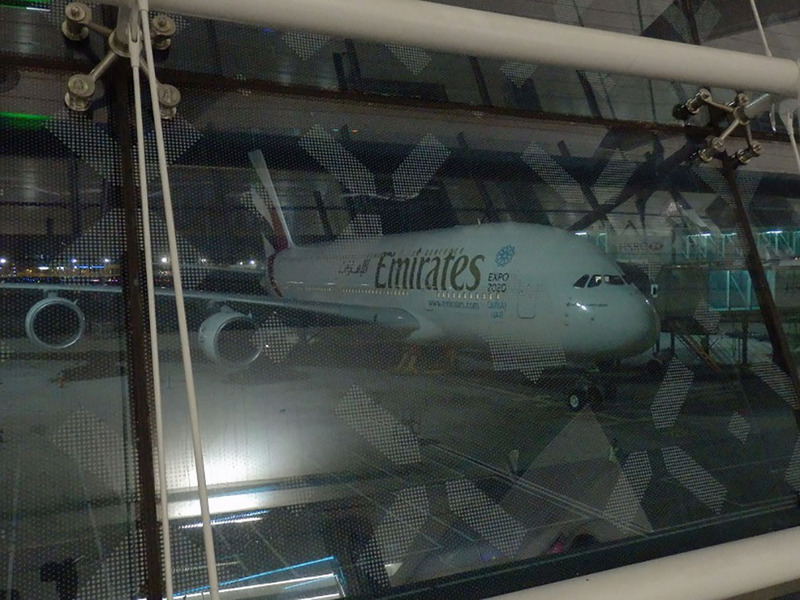 You can also read my review of Emirates A380 in Business Class from Brisbane to Dubai. Emirates Airbus A380 now flies out on all it’s main international routes. 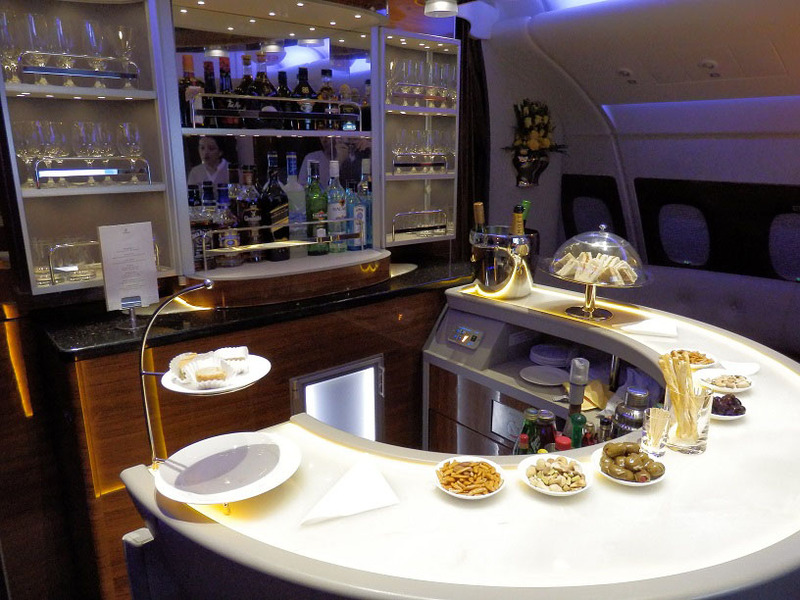 The advantages of travelling on the Emirates’ A380 in Business Class include pleasingly plush and comfy seats, extensive amenity kits, wonderful food and an attractive bar choc full of goodies on the upper deck. 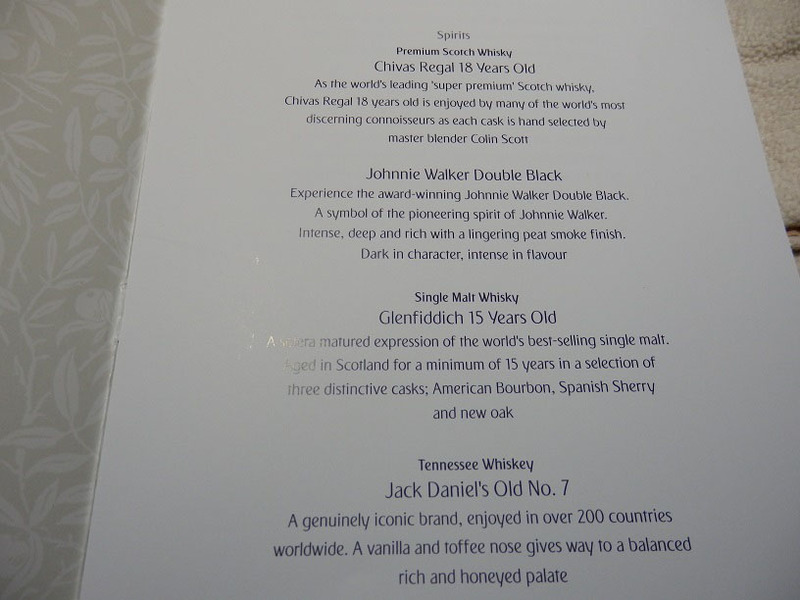 Worth noting is that flying the Emirates Airbus A380 is a much nicer flight experience to flying in their Boeing 777. 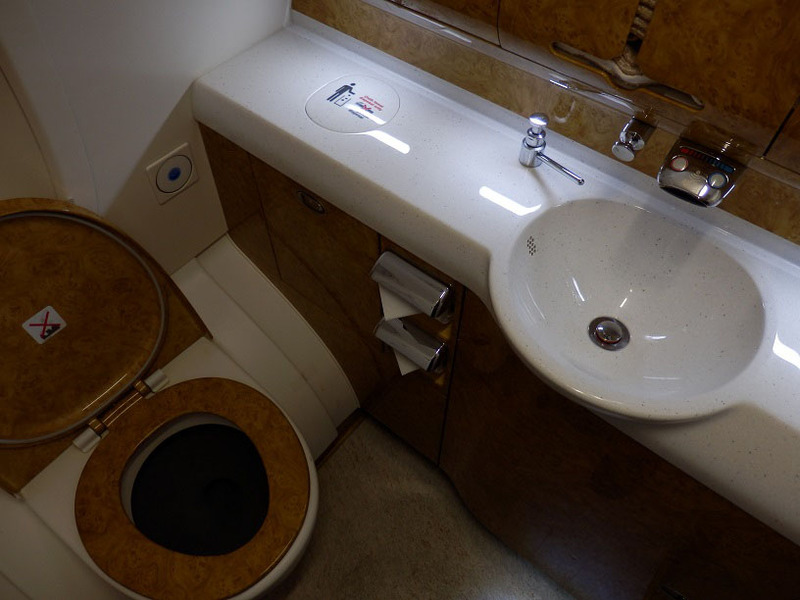 Emirates offers Business Class on both aircraft types but the product you get is better on the A380 (Read my review of my Emirates Boeing 777-300ER Business Class trip between Dubai and Brussels). 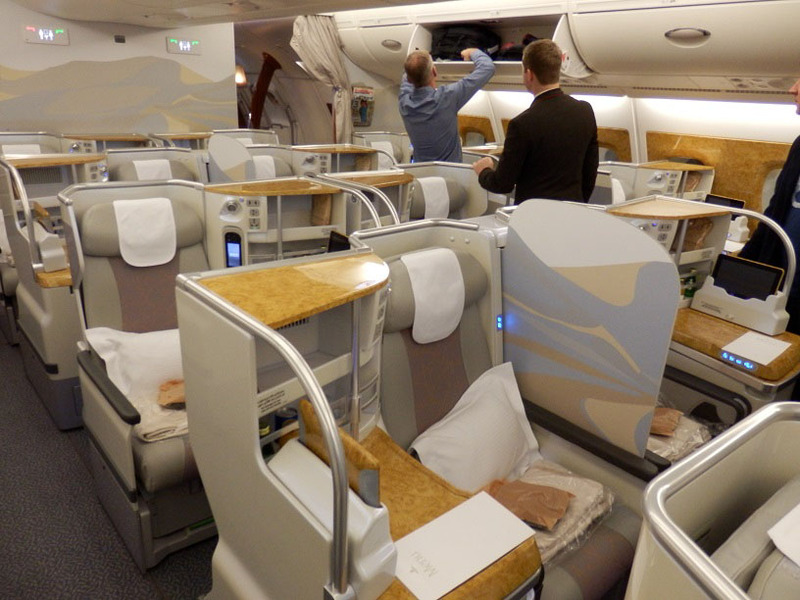 Emirates’ Business Class seats are located in 2 rooms on the upper floor of the Emirates Airbus A380, sat to the rear of the First Class cabin. The first cabin is larger with 58 seats, while the rear cabin (just in front the bar) contains just 18 seats and feels more boutique. The configuration in Business Class is 1-2-1, which is great as it gives each seat direct aisle access. The cabin feels luxurious, with classy burled walnut veneer, gold trim and pearlised plastic that frames the seats. 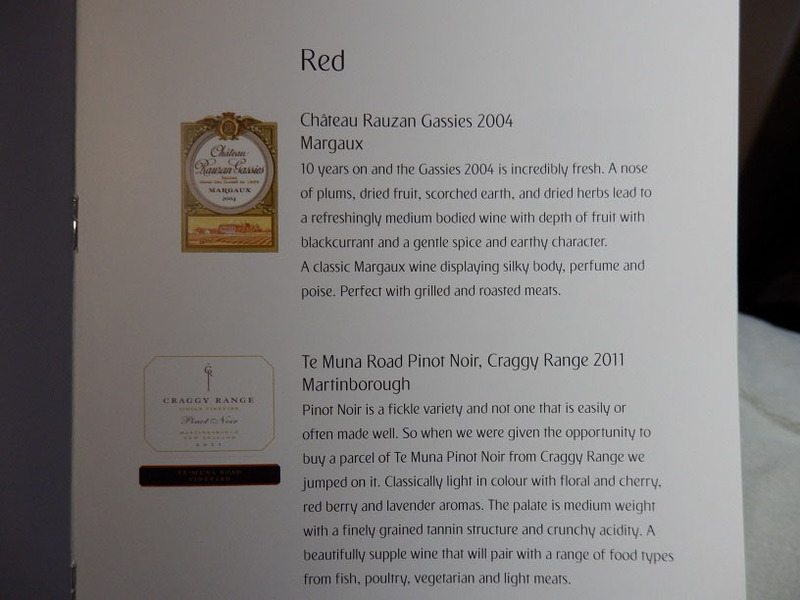 The mood lighting during the flight meant that the colours of the ceiling changed with the local time. I particularly like the starry sky panels which are shown during the night time. 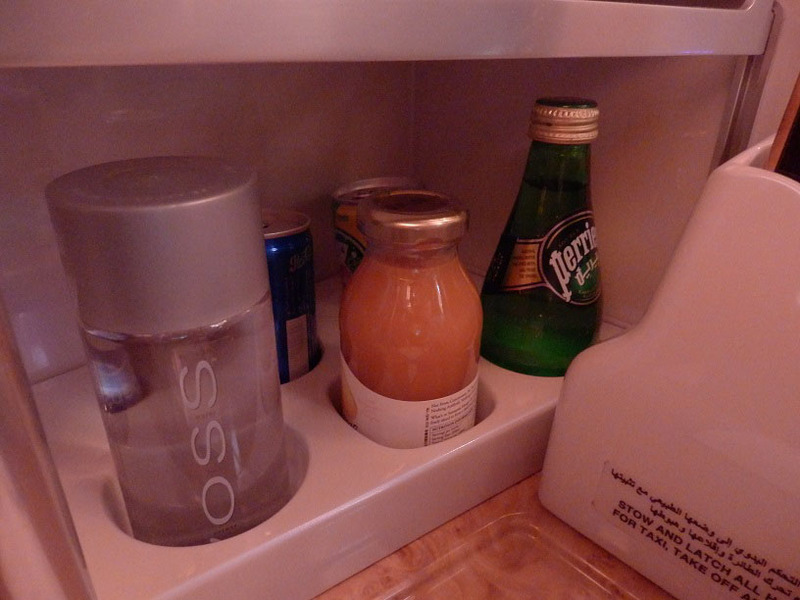 Each seat comes with loads of storage, an in-seat power supply, a side desk for space to work, and your very own minibar (not refrigerated), stocked with soft drinks. The seat can be reclined into a full, comfy flatbed. Each seat also comes with a thin blanket, a large sized pillow, a duvet, noise cancelling headphones, flight socks and earplugs. 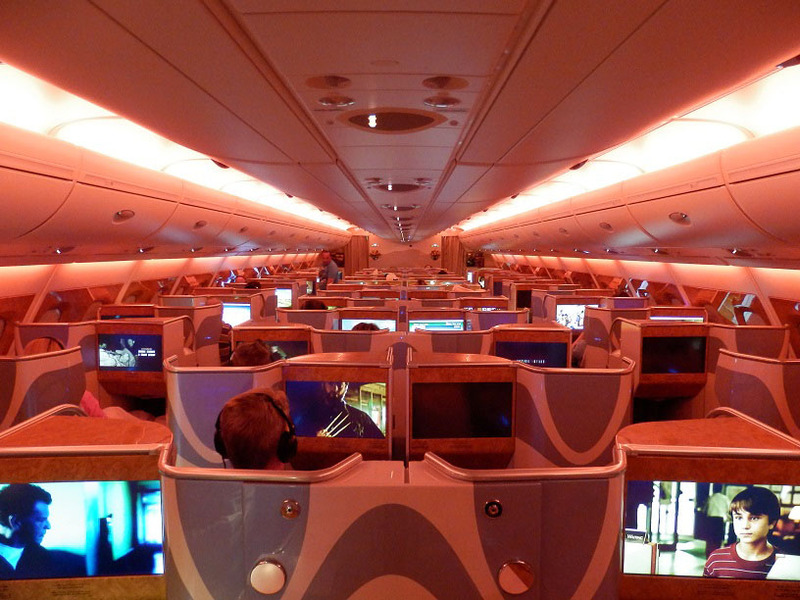 Read this article on how to choose the best Emirates A380 Business Class seat on the A380. 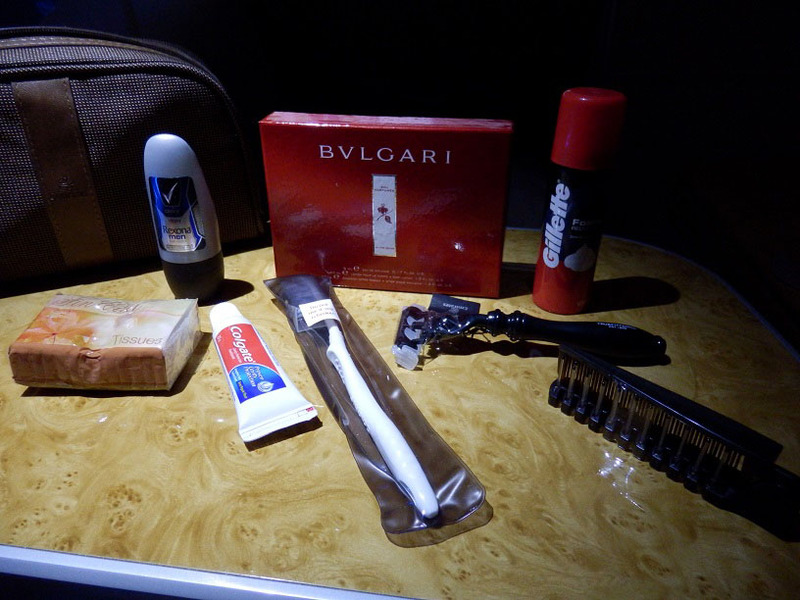 The Emirates Business Class amenity kit was provided in a large luxury wash bag, and contained toothbrush, toothpaste, handkerchiefs, deodorant, Gilette shaving foam (men), a razor, moisturiser and aftershave by Bvlgari. The women’s one has more feminine product ranges. 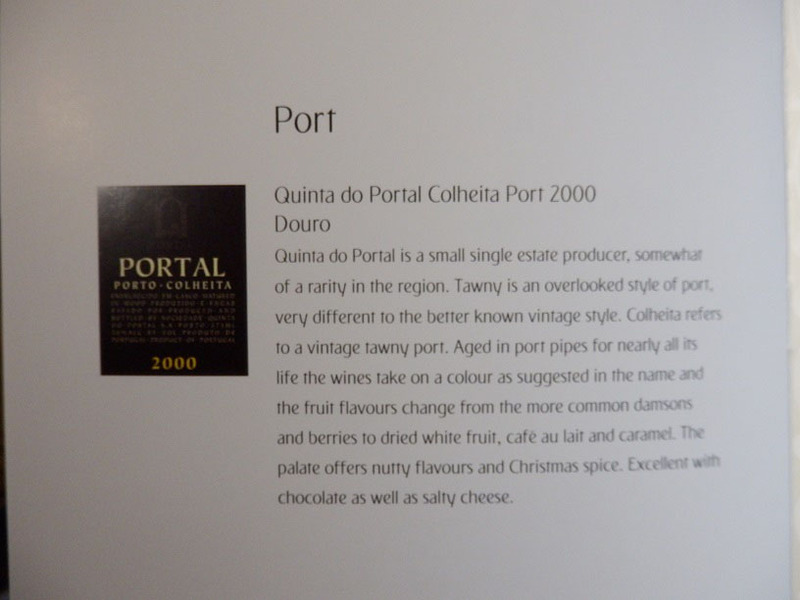 Pyjamas were not offered on this long haul overnight flight, unlike Qatar Airways. 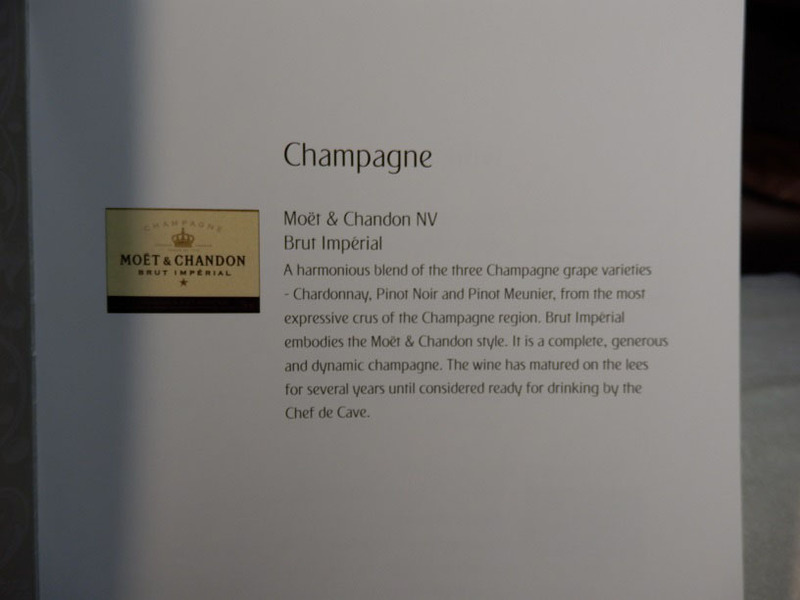 As you arrive you can chose between a glass of water, orange juice or Veuve Cliquot. 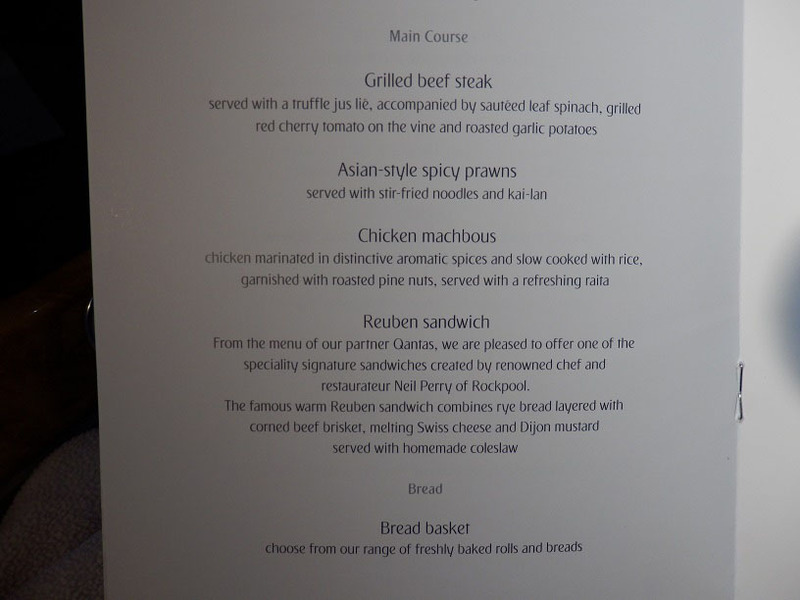 Before take-off, you also get a refreshing hot towel (hot towels were also served before lunch and prior to landing). 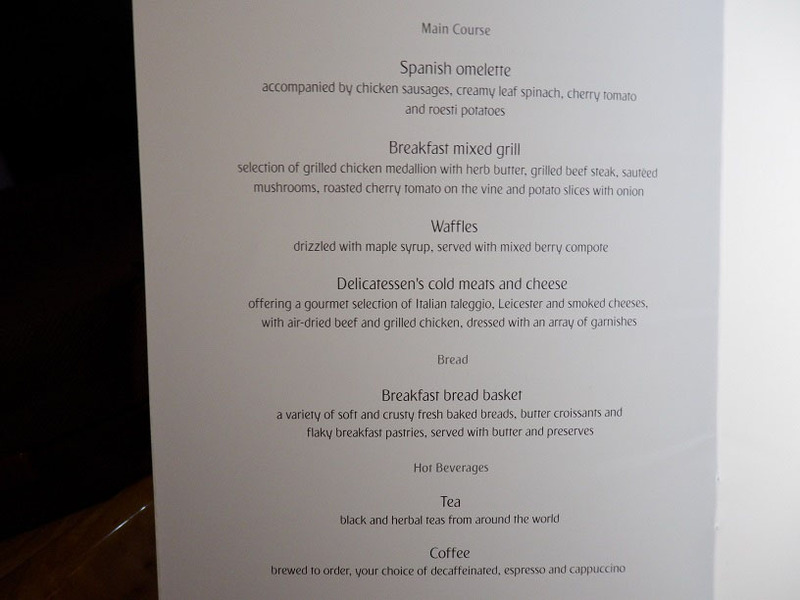 After take off (after around one hour), a large breakfast was served (at the local hour 2 am!). 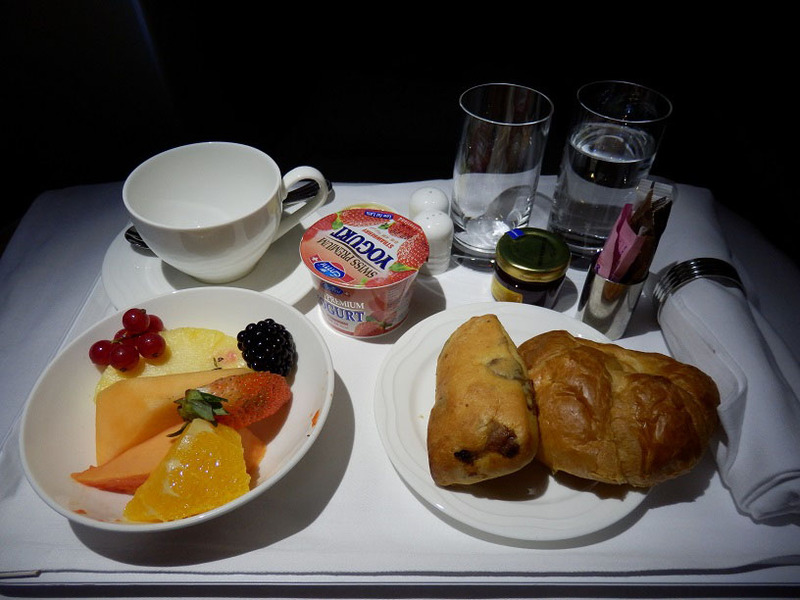 It consisted of fresh mango juice, fruits, yoghurt, and bread (butter croissant plus a pastry). 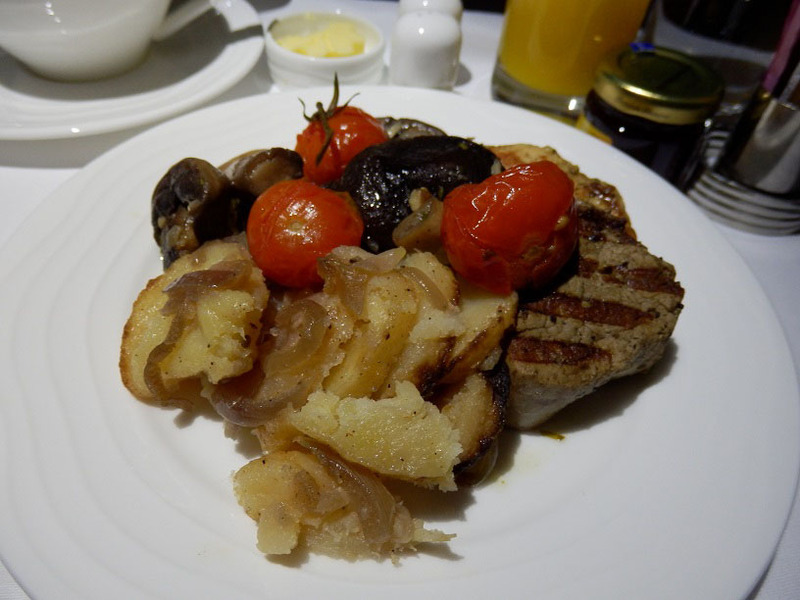 For main course, I choose the mixed grill made up of chicken, steak, mushrooms, roasted cherry tomato and potato. 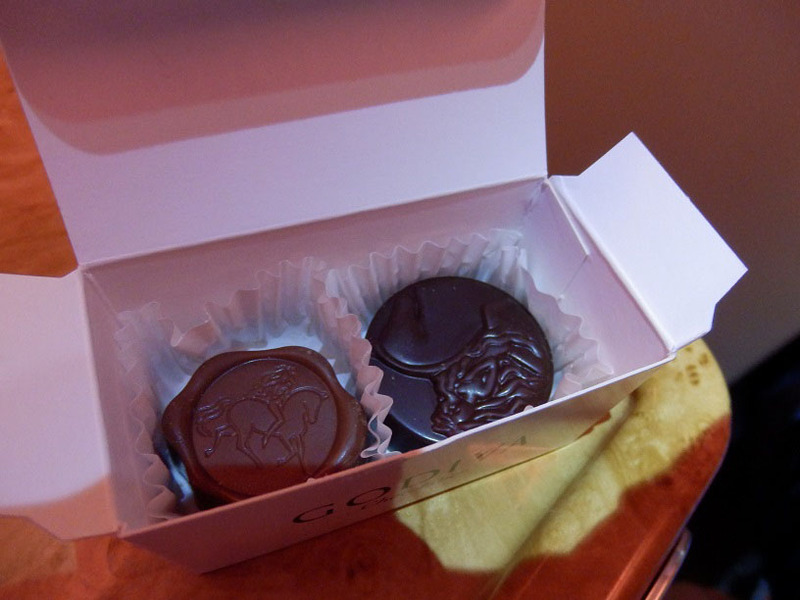 Around two hours prior landing, “lunch” was served (at 7 pm local time). 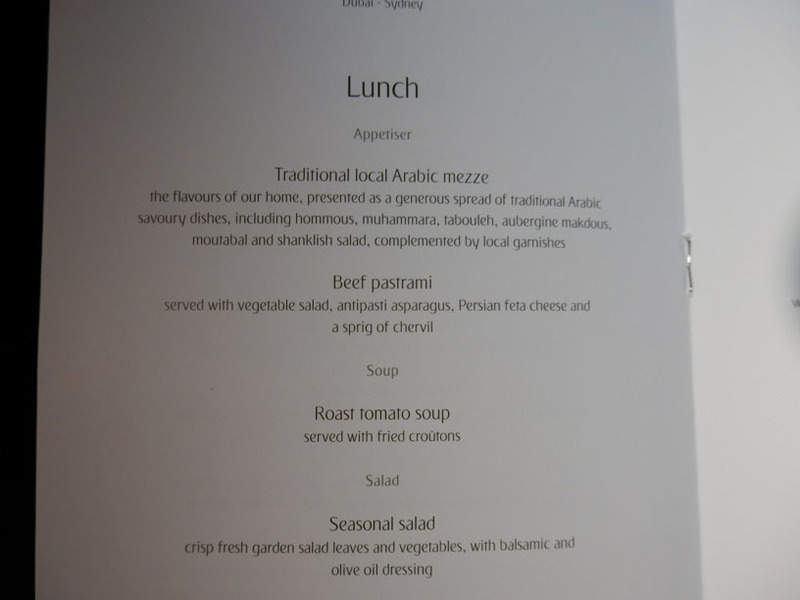 As as starter, I choose the Arabic mezze complemented by garnishes and a salad. 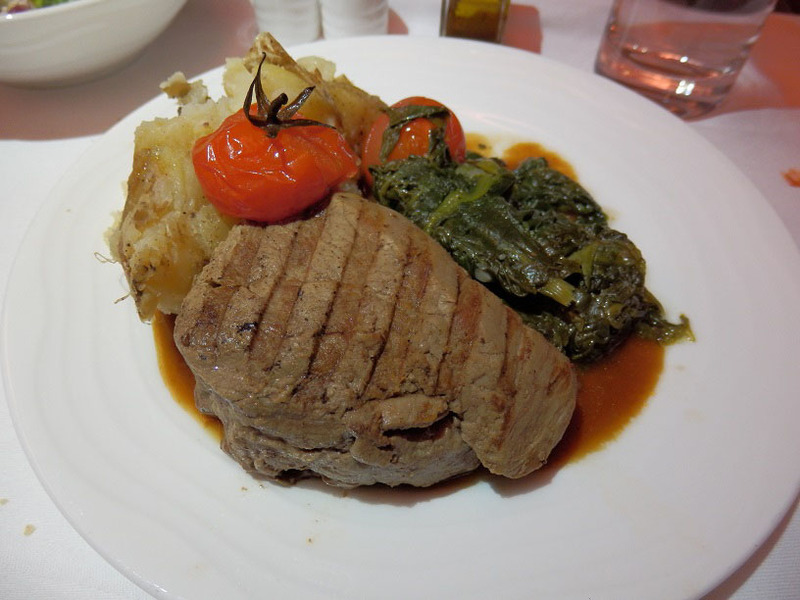 The main course was also good and was grilled beef steak with truffle jus, sauteed leaf spinach, grilled tomato on the vine, and roasted garlic potatoes. 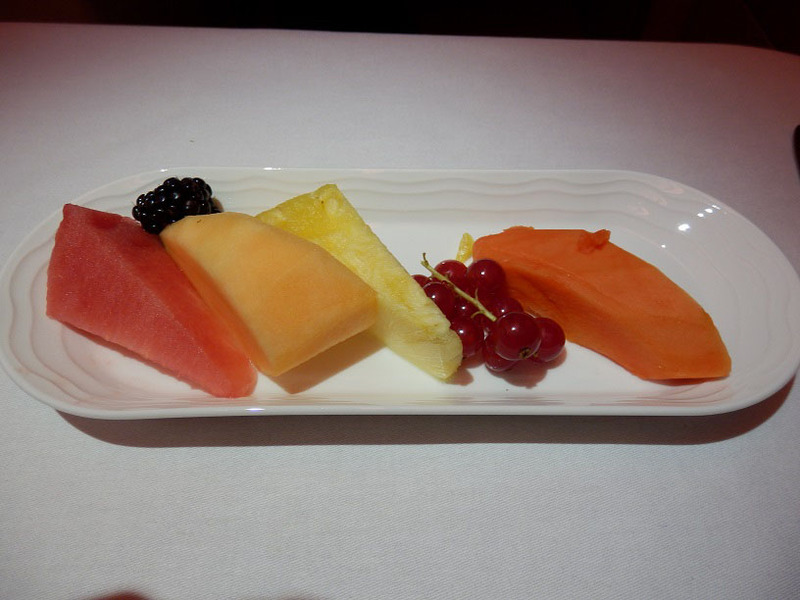 As a dessert, I choose the fruit. 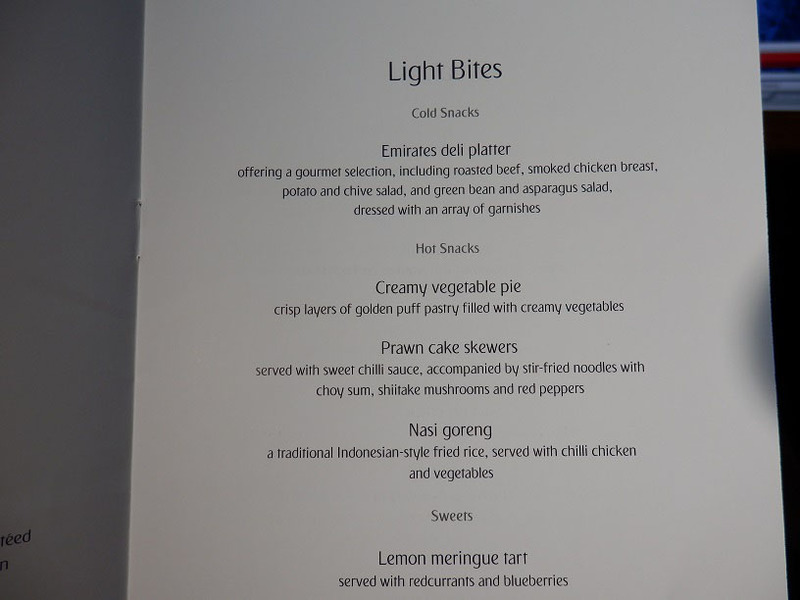 For the hungry ones, light bites were non-stop available during the flight, from cold snacks (deli platter) to hot snacks (e.g. creamy vegetable pie, prawn cake skewers, nasi goreng) and sweets (lemon meringue tart). 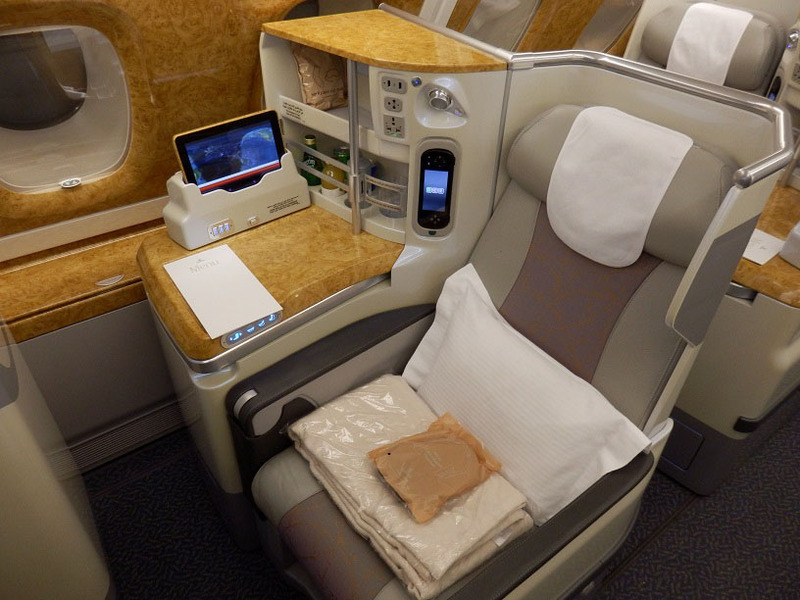 The Emirates A380 is the inflight entertainment system is excellent with an extensive range of new-release and classic films, television shows, box sets and audio options. You have up to 1,800 channels of movies and TV shows in multiple languages. 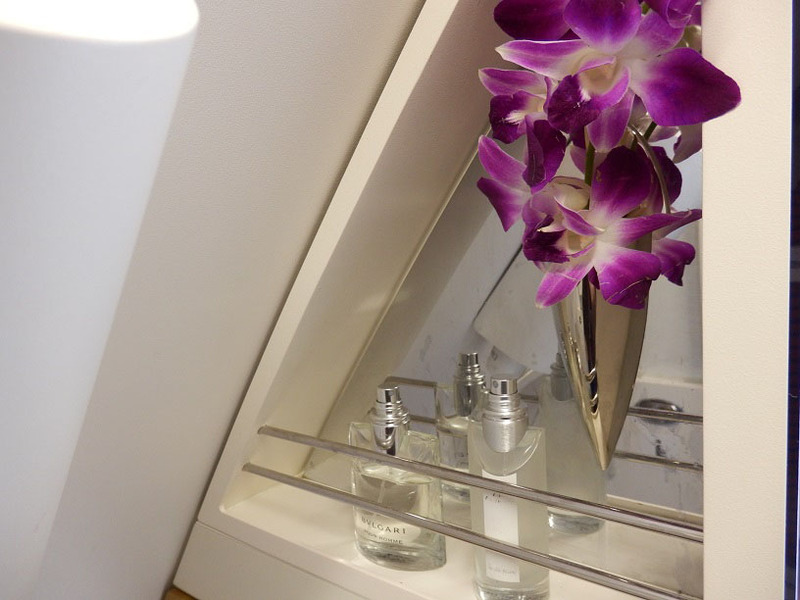 You can also play games or watch the cameras installed in the tail, nose and back end of the A380. 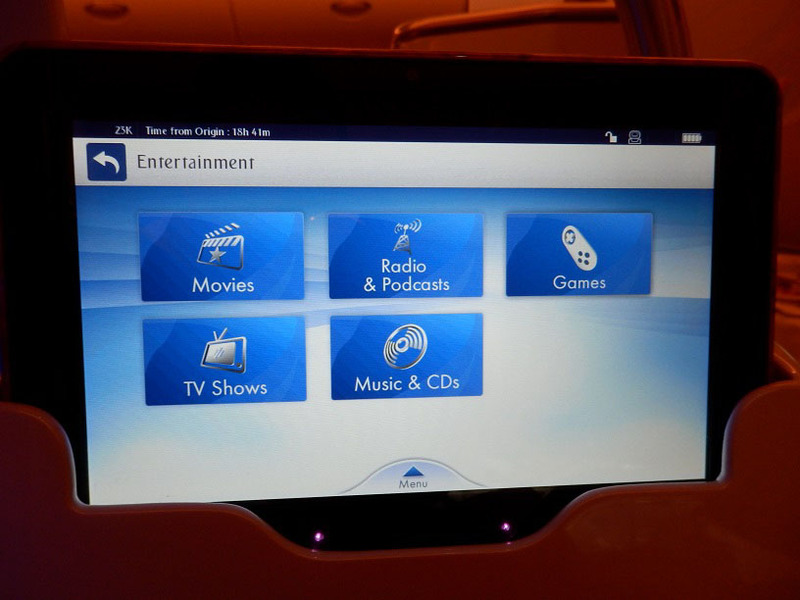 The inflight entertainment is displayed on a large 17-inch (43 cm) touch-screen. 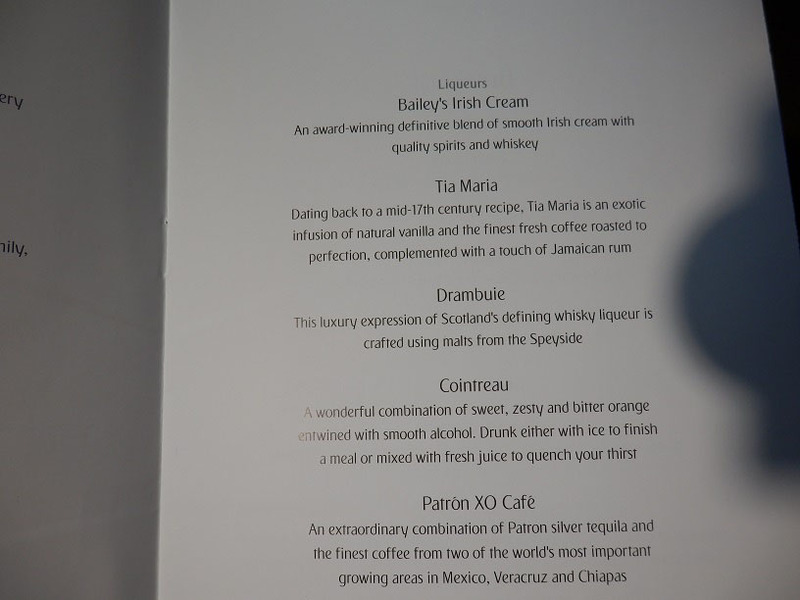 The A380 Onboard Lounge is a bar which is exclusive to First Class and Business Class customers and the interaction point or meeting place during the flight. 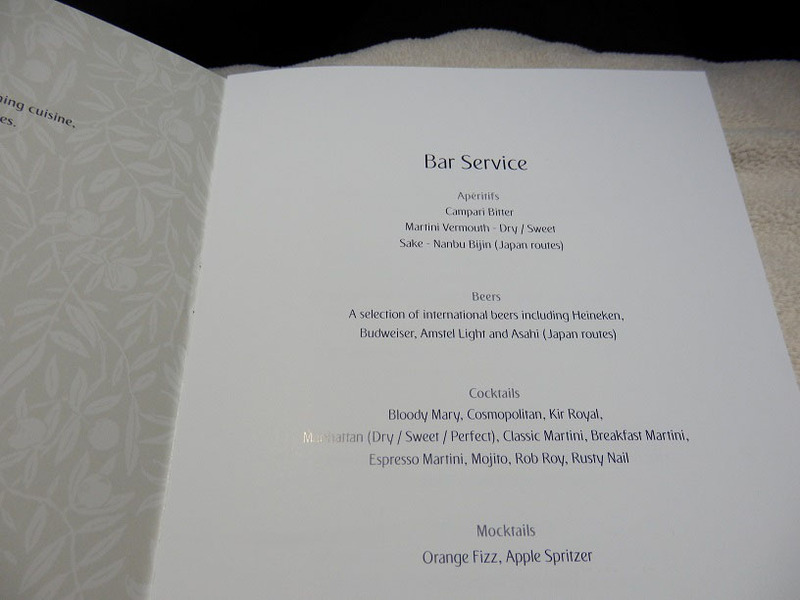 There was a selection of premium spirits, wines, champagne, cocktails and beers plus hot and cold drinks served by a dedicated bartender. Emirates offered 10MB of free WiFi to each passenger during the flight. An additional 600MB could be bought for $1. If you exceed that limit, you could buy yet another 600MB for $1. WiFi worked great. 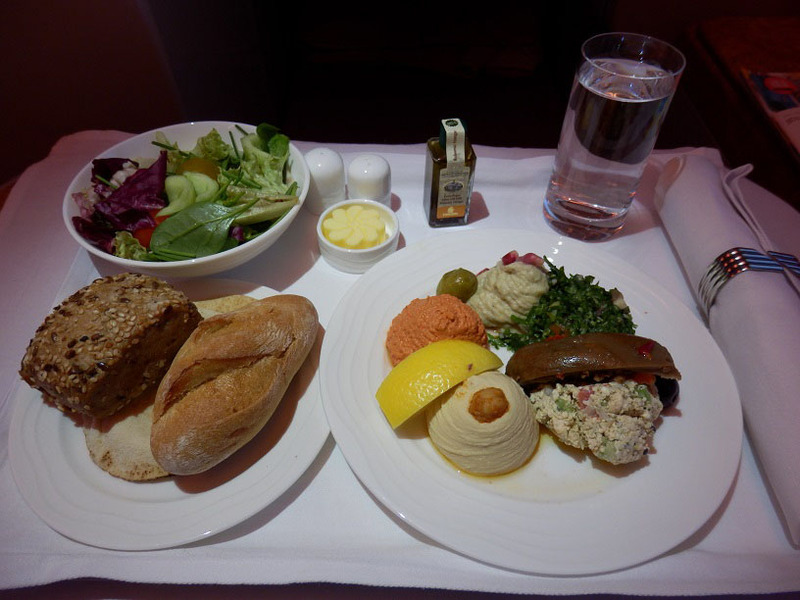 You can read more of my Emirates Business Class and Emirates First Class flight reviews and my comparison between Emirates vs Etihad vs Qatar Airways: the best airline in the Middle East. 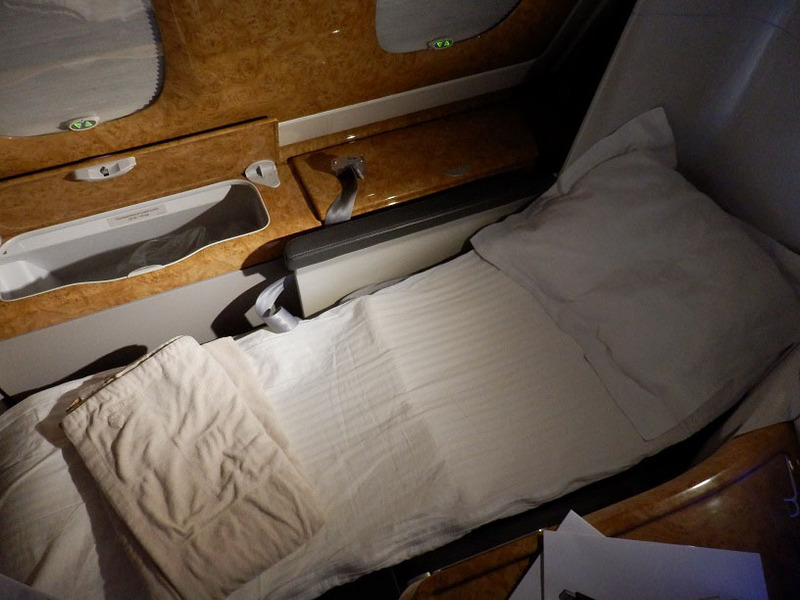 You may also want to read my other long haul Business and First Class flight reviews on Emirates.